On his arrival in Cuba in GoldenEye, Bond wears a linen or linen blend twill suit made by Brioni in their “Augusto” model. The twill suiting is two-tone, woven with light brown and white yarns to effectively look tan overall. The twill weave helps the linen to wrinkle less than it would in plain weaves, though it’s not going to breathe as well. But since it’s linen it still wears cool. The button three suit jacket is full cut with straight shoulders. It has swelled edges, button three cuffs and straight pockets with flaps. The trousers have a wide leg with double or triple reverse pleats, and the bottoms are finished with turn-ups. Bond wears the suit trousers without the jacket on the beach and rolls up the bottoms. Bond’s white shirt from Sulka is most likely a blend of linen and cotton. This shirt has a moderate spread collar, front placket and double cuffs. Though double cuffs are a little out of place with this rather casual suit, Bond is not committing a faux pas either by wearing them. Double cuffs would look more congruous if Bond were wearing a tie, however, this suit is casual enough that it can work well the way Bond wears it without a tie. Bond’s shoes are medium brown brogues, which look rather heavy for such a light suit. On the other hand, the Persol sunglasses are the perfect accessory for a linen suit in Cuba. 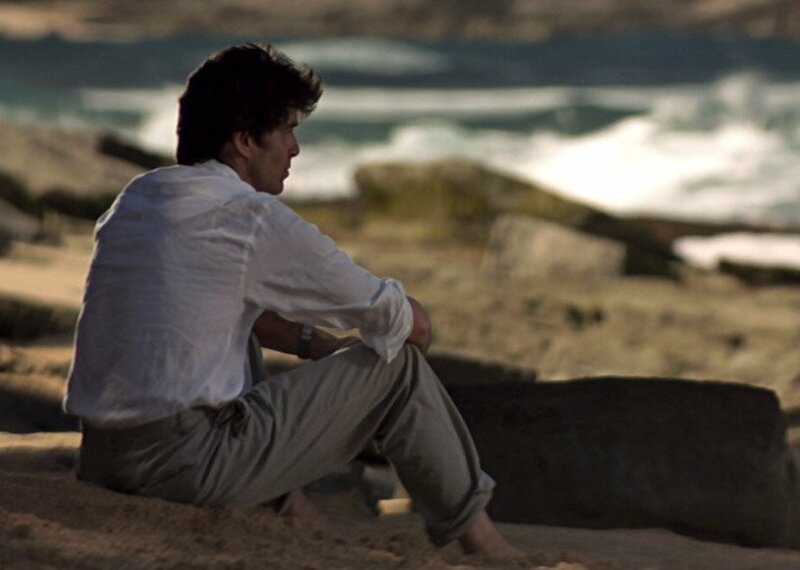 Later on the beach, Bond wears what appears to be his suit trousers without the suit jacket, but with a different white shirt. This shirt, possibly also from Sulka, is likely made of all linen. 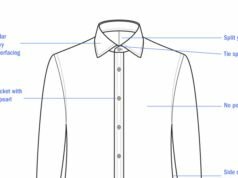 Not much of the shirt can be seen, but it has shoulder pleats and a softer collar with stitching further from the edge than on the first white shirt. I agree with regard to the shoes. Matt, what would your recommendation be for the footwear? Chocolate brown suede derbies? Or loafers, perhaps? Lighter brown suede derbies would work, as would loafers. There’s an example where I think Timothy Dalton does it better! Can you explain swelled edges a bit? It’s the sporty detail created by the stitching 1/4″ to 5/8″ from the edge. It looks kind of like piping around the edge of the lapel. I like this suit,and not seems to me so “full” like many 90s suits (especially Americans). This silhouette is fresh air in a age of ultraskinny suits. I haven’t seen a photo of the top of the trousers, which is why I said they could be double or triple reverse pleats. They look fuller than some of the other suit trousers in the film, which have double reverse pleats. The beige trousers with the navy blazer have triple reverse pleats, so it’s certainly possible that these could have the same. Many of the Italian suits at this time were very full cut, more so than the American suits. Lindy Hemming had these suits made an inch fuller around the waist than Brioni would typically make them. Hemming wanted less waist suppression for a more contemporary fit. The relaxed fit may be a little too generous, but is appropriate for the setting. It seems, in general, that most believe men’s clothing should either be “full cut” or “slim cut.” I believe that clothes should fit the individual, not trends, but I suppose I would want mine in the middle. Do you have a manner in which you err? Do you (generally) prefer full cut or slim cut, or vice versa? The relaxed fit here is indeed very practical for the climate and material. Linen that is too tight will crease more. 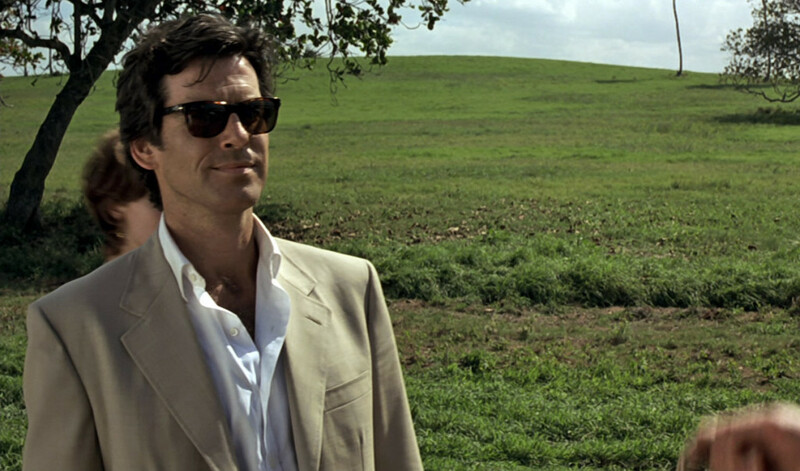 Brosnan’s linen suit in The World Is Not Enough isn’t as full cut as this suit is, but it isn’t close-cut either. I don’t like the term “slim cut” because now it has come to be synonymous with something that is too small. I like something that is cut closely but has fullness where necessary. Something like Roger Moore’s Cyril Castle suits comes to mind. All of Moore’s suits, no matter the tailor, have a fit that isn’t determined by trends. Other parts of his suits certainly are influenced by trends, but the fit is not. I liked the tailoring of Roger’s suits. The fit was close enough to complement his frame, but not too tight either. I think Sean’s suits were well tailored as well, but seemed less fitted than Roger’s. They seemed to play down his frame more than emphasize it. Roger’s suits made him seem more athletic than he was. 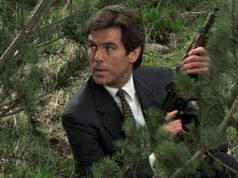 I don’t know if it’s the “fullness” of the cut or just that Brosnan was near-manorexic when he shot Goldeneye, but rewatching the scene (as opposed to looking at screencaps) the suit just doesn’t seem to sit right on him, especially the shoulders and chest. At first I thought that it was the built-up shoulders, but it appears that the shoulders on his linen suits in TWINE and DAD are even more built up (and the suits have a fuller cut overall) yet they seem to look better on him. He looks a little-scarecrow-ish here, so I’ll put it down to his weight. For years I thought that this suit looked better than Dalton’s in TLD but upon rewatching the scenes I like Dalton’s better. I think it looks a little stiff in still photos, but watching the film itself it moves very well. It also seems to fit him rather well, too. As you’ve almost run out of outfits (though did you do Dalton’s all-black ensemble from LTK when he investigates Krest’s warehouse?) perhaps examining similar outfits between different actors could be interesting, such as comparing Dalton’s and Brosnan’s outfits here. I would agree that comparison between similar outfits between actors would be very entertaining and educational. But I’m kind of worried that the comment section would probably go off topic pretty quickly. Everybody has their own favorite Bond and different views on what constitutes “good taste”. I mean, look at what happened to a discussion about printed ties! Regarding the outfit, I like the tan suit he wore with the blue shirt in TWINE a lot better. I would expect most people to agree with you on the TWINE suit over this one. That suit has a more timeless fit, and the blue royal oxford shirt adds more life to the outfit than the white shirt does here. Yes, I think the blue shirt is what makes it better. I like the blue/tan combo very much. Brosnan seems to wear that combo quite often. 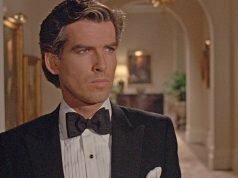 Other than the Bond movies, he wore it in Tailor of Panama I think. I also saw a picture of him in a promotion for Mamma Mia wearing that same combination. Btw, I agree that he does look sort of thin in GE. It’s strange that I saw a lot of his earlier movies while growing up (Live Wire, Around the World, Mrs. Doubtfire) and I never thought he looked too thin. He looked perfectly believable as an action hero back then. I guess my standards are just different nowadays. I prefer the linen suit of TWINE because the color scheme worked better in my opinion (French blue shirt vs white shirt) and because of the beautiful brown monkstrap shoes which seemed more appropriate with a casual summer suit than heavy brogues (Matt, have you a picture of the outfit with the shoes ?). On the other hand the suit looks still very good to me. I thought Brioni made suits with a clean, structured chest ? Here the chest seems to have some drape. Is this the case with others suits in the movie, Matt ? I’ll have to see if there’s something I can post that shows the shoes. There isn’t really any drape in this chest. With drape you see a fold in front of the armholes, and here it’s a result of the chest not having enough structural support. It looks like this suit probably has a lighter canvas than Brioni usually uses, which would surely make this suit more comfortable in the heat. Matt, I thought you might be interested. I am pretty sure there are two different white shirts ; the one on the beach has a less taller collar and the fabric seems to be all linen or something similar, since it looks really soft and has no structure at all. Compare it to the collar of the shirt worn with the suit ; doesn’t it have a taller collar and taller collar points too ? Even the stiching looks a bit different. I hope you will find it useful ! I’ve taken a closer look at the shirt. The stitching on the collar is what looks most different, though it’s hard to compare the sizes of the collar since the shirt on the beach is very rumpled.